What were the Four Sleeping Soldiers looking at and what will Warsaw's residents look at in the future? Here, we examine the history of Warsaw's most contentious monument. Four Sleeping Soldiers, Three Fighting Soldiers; or sometimes Four Sad Soldiers, as the residents of Warsaw have nicknamed it. The Monument of Gratitude, Liberation, Heroes is how the press of the 1940s and the 1950s referred to it. Its official name is Warsaw’s Monument of Comradeship (Polish-Soviet comradeship, of course). At the top of the monument: three soldiers in combat positions – these were the Soviet soldiers. Below: four soldiers of Berling’s Army (the Polish forces under Soviet command) hanging their heads low, looking down at passers-by, halted in “guarding” positions. It was the first monument raised in post-war Warsaw, a city of ruins and tombs, which continued to rise up from the turmoil of war for over a decade. The monument was unveiled by Bolesław Bierut on 18th November, 1945, in Warsaw's Praga district, on the right-hand bank of the Vistula. To be exact, on Wileński square (its official name since 2001), by the intersection of Świerczewski Avenue (nowadays the Avenue of Solidarity) and Targowa Street, right next to a building by 74 Targowa, (i.e. the headquarters of the Provisional Government of the Republic of Poland and State National Council, and the first HQ of the Office of Public Security), near the Cathedral of St. Mary Magdalene, a Polish Orthodox Church, and close to the Warszawa Wileńska Station (today, we’d rather say: close to the Wileńska Station Shopping Centre). In the times of the czar it was called St. Petersburg Station, since the trains to St. Petersburg via Vilnius began their route here. The Orthodox church was built at the end of 1860s so that travellers from the Empire could feel at home. Russians destroyed the station when withdrawing from Warsaw in 1915; when Poland regained its independence, the station was rebuilt and renamed Warszawa Wileńska Station. After World War II, the station became less important, and a provisional building at the end of Targowa Street played the role of a station from then on. At the beginning of the 21st century, Wileńska Station was engulfed by a shopping centre, whose shape and glass walls don't correspond with Praga’s style. Praga suffered the least during the war. Its buildings were only slightly damaged, especially when compared to the hecatomb on the left side of the city. The walls were really there. But it was just an outline of what was there before. The empty eye sockets of windows didn’t reflect the glare of the sun in the panes. Because there were no panes. There was nothing besides an outline. Abstraction substituted real buildings. We saw surrealist paintings of stoves hanging high above, bathtubs, miraculously saved wardrobes, parts of buildings and everyday items, thrown around in great disarray. And twirls of pipes, melted in this huge foundry of destruction. It was another Warsaw, a Warsaw which wasn’t there. – Jan Szeląg (Zbigniew Mitzner), a journalist and a chronicler of Warsaw history, recalled in 1967. Halina Barańska told the story of her aunt, who was given ten minutes to move out of her flat at Targowa Street. When she protested, by saying that even the Nazis would give several hours to move out, she was allowed an hour to collect her things – she took family photographs, some clothes and bedding. In the first months of post-war Poland, Praga was the centre of the capital. Solidarity/Świerczewski Avenue, upon which the Monument of Polish-Soviet Comradeship was raised, leads towards the Old Town over the Śląsko-Dąbrowski bridge; in November 1945 – it led towards the ruins. When the Polish-Soviet authorities were creating the foundations of its symbolical universe, Warsaw residents wondered how to commemorate those who died in Warsaw, in particular those who were killed during the Warsaw Uprising. 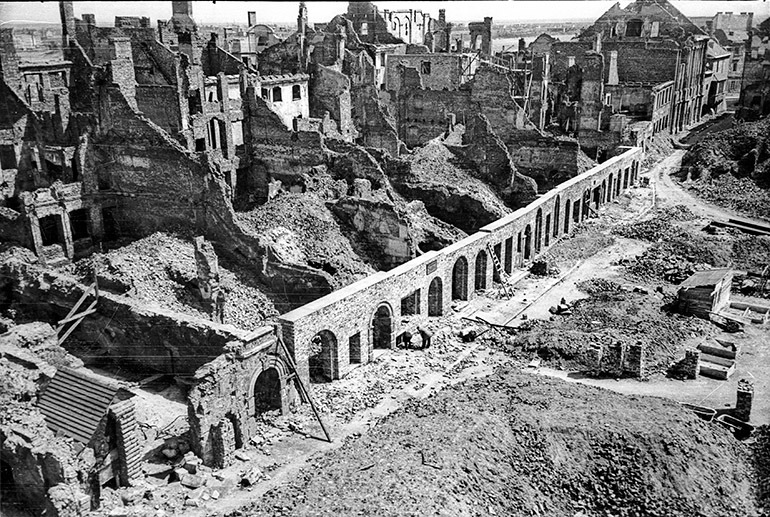 In June of 1945 Życie Warszawy (“Life of Warsaw” newspaper) reported that upon Powiśle (at the foot of the university), an area 100 by 125 metres would be demarcated, on which, between burned buildings and the ruins of barricades, “trophies of the battle, in the form of tanks, armoured cars, weapons, etc.” would be collected. Raw “souvenirs”, dead spaces left without commentary, and a place left outside the plans for reconstruction, seemed to be the best way to commemorate the times of war. Other ideas included leaving piles of rubble in each district of Warsaw (the biggest pile, along with “some monument”, was meant to be put on Krakowskie Przedmieście), refraining from rebuilding the Old Town and creating an open museum out of it or keeping the ruins of St. Alexander’s Church by Plac Trzech Krzyży (Three Crosses Square). Dresden, bombarded by the Allies, was an example: the destroyed baroque Frauenkirche (Church of Our Lady) wasn't rebuilt until 2005 (this idea wasn’t executed in Poland due to its religious connotations). Neither of these projects was realized. 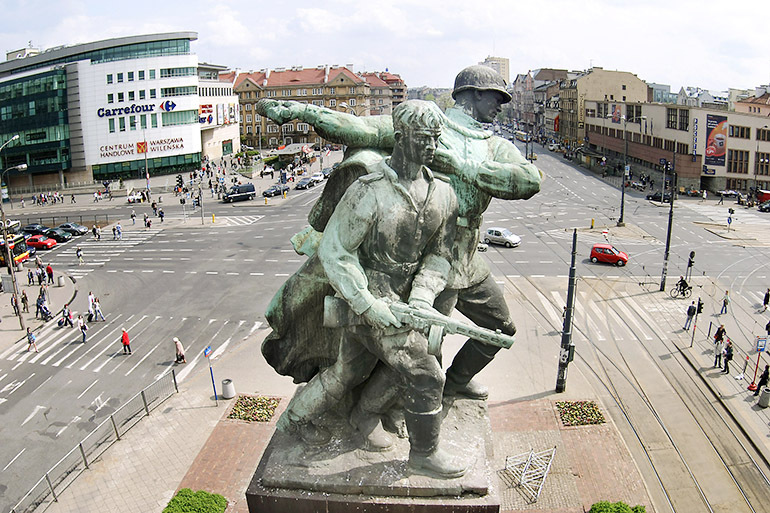 The comradeship monument was designed by an engineer and major in the Red Army, Koralow, and it was quickly finished by Polish sculptors and architects. The pedestal was covered with black marble slabs and the silhouettes of the soldiers were made with poor quality plaster, coated with patina. At first, the press would report that the monument commemorated the Soviet artillery and its remarkable contribution to the victory over Nazi Germany (which is also remarkably cynical given that the Red Army waited and rested on the Praga side during the Warsaw Uprising). On the side of the pedestal an inscription in both Polish and Russian said: “Glory to the heroes of the Red Army, killed during the combat for Poland’s liberation”; the inscription was later changed to: “Glory to the Soviet Army. To commemorate Comrades, who gave away their lives for freedom and independence of Poland, this monument was raised by Warsaw's residents in 1945”. The official unveiling of the monument took place in the company of notable persons, including Bolesław Bierut, three volleys of cannon fire in salute, and a military orchestra playing a funeral march – W mogile ciemnej. The slabs of the monument turned out to be very impractical since they could easily be scratched. The Praga youth enthusiastically made use of this, and after a couple of years, some of the slabs flaked off. An urban legend says that the marble was taken from a Jewish cemetery, and that the falling slabs revealed inscriptions in Hebrew. They were substituted with limestone. The figures of soldiers were also changed – they were cast in brass, which supposedly came from melted German shells. The monument also served as the site for the solemn celebrations of the anniversary of the Great October Socialist Revolution. For the 35th anniversary, the Warsaw Philharmonic performed a concert under Witold Rokowicki’s direction. The programme included the works of Prokofiev (Russian Overture) and Moniuszko (Overture from Halka); actors declaimed Mayakovsky’s poem about Lenin and Pasternak’s Rodowód. The Delegacy of the Central Committee, led by Stanisław Łopot, a deputy minister of the Natolin faction, placed flowers under Warsaw’s first post-war monument. What were the Four Sleeping Soldiers looking at? The Monument of Comradeship was neither demolished nor dismantled after the fall of Communism. Some attempted to do so in 1992, however, a notable Warsaw sculptor, Stefan Mamot, objected and revealed himself as one of monument’s authors (other authors included Stanisław Sikora, Józef Trenarowski, Józef Gazy and Bohdan Lachert). Stefan Momot explained on the website Twoja Praga / Your Praga that his design did not include the five-pointed stars for the soldiers. They were only meant to have a crowned eagle. Stefan Monot designed and left the monument in such a form, since this is how the authorities decided. Architect Bohdan Lachert designed the pedestal, as well as the nearby post office, the Muranów neighbourhood and the cemetery of Soviet soldiers. Four Sad Soldiers disappeared from Wileński square in 2011 due to the underground construction of the Warsaw subway’s second route. 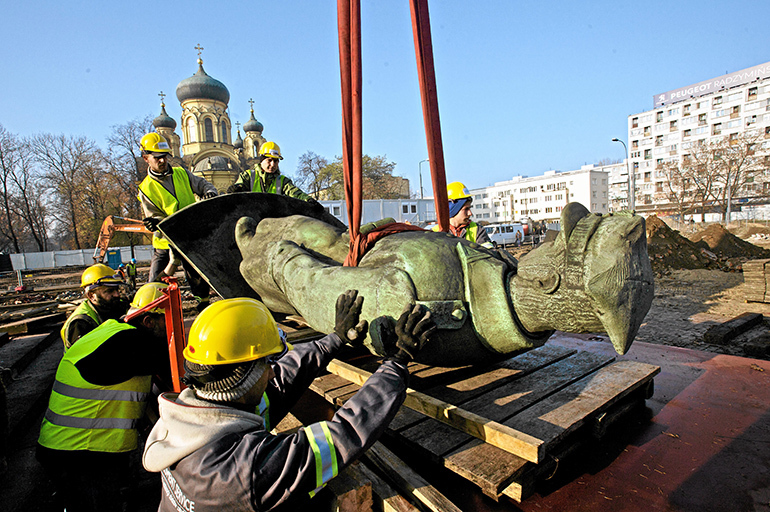 In 2013, City Hall organized a poll asking Warsaw residents whether the monument of “Four Sleeping Soldiers” should remain in its current location or if it should be moved to another spot. Only 800 people responded (so not quite representative): 72% wanted the Sleeping Soldiers put back at its old location (or at least as close to the old location as possible, since the square is being rebuilt due to the subway construction), 12% wanted the monument moved elsewhere, 8% was in favour of liquidation, 7% had no opinion and 1% had a different solution. Dr Andrzej Zawistowski of the Institute of National Remembrance reacted to the outcomes of the poll and published a booklet: What Were the Four Sleeping Soldiers Looking at? Until mid-1945, the headquarters of the new Polish authorities, appointed by Stalin, were situated in close proximity to the monument: the quasi-parliament – State National Council and the Provisional Government of the Republic of Poland, and later, the Provisional Government of National Unity. A USSR embassy was located 200 metres away. There were many institutions of the state apparatus of repression situated within a few hundred metres' radius: the Warsaw Office of Public Security, a detention facility of the Voivodeship Public Security Office, the Ministry of Public Security's Warszawa III Prison, the main headquarters of the NKVD in Poland, the headquarters of units of the NKVD and the Red Army (including the Red Army’s Military Tribunal, the prosecutor’s office and Warsaw City Command). In each of these places “the enemies of the state”, including soldiers of the Home Army, the Freedom and Independence organization and members of the National Armed Forces, were interrogated and tortured. Commemorative plaques and inscriptions carved on basement walls by prisoners are there to remind us about it. Where will the Soldiers fall asleep? Not one of our party members wants to keep the monument, the mayor of Warsaw is also against it. The figures of soldiers have been renovated and left in a warehouse, and things will remain this way at least as long as Hanna Gronkiewicz-Waltz (Warsaw’s major) is ruling the city. We’re unconscious that the past lives inside of us, against our will. (…) But my memory is shaping me along with the present day. I’m not brainwashed, my memory is not artificially whitened. He wrote about it in the context of the Warsaw in Old Photographs album, which showed only one side of the city: a postcard-like, cheerful and homogeneous life. One of the photos included an image of the prestigious Aleje Ujazdowskie / Ujazdowskie Avenue, only not quite as Szeląg remembered it, when mounted police attacked a working class march in 1930; some of the protesters were hurt, some were killed. There is no miserable Powiśle, no Jewish Praga either (I’ve been focusing on this district the whole article and I haven’t mentioned that before the war, Praga was pulsing with Jewish vibrant life, which is often difficult to remember, since only a few traces of this “common” past still exist). Now another spot disappears from Warsaw and breaks the historical continuity of the city. Buildings and cities are instruments and museums of time. They enable us to see and understand the passing of history, and to participate in time cycles that surpass individual life – wrote Finnish architect Juhani Pallasmaa in his manifesto, The Eyes of the Skin: Architecture and the Senses. In 1945, the Four Sleeping Soldiers symbolized the cruelty and humiliation of enslavement, and the monument became a site for quasi-religious tributes (in his biography, Karol Modzelewski wrote about the ritual chants and applauding). In 2015, the Soviets are no longer here, and their monuments and myths no longer have any power: they’re scarecrows, places which have witnessed the past, places which can simultaneously bring out the memories of painful history and at the same time – reminisce of a first date or a first cigarette. In the context of the unimaginable suffering that has occurred here in the past, this may sound naïve, but this area is marked with more than history and anguish. Stalinism uniformed human thoughts, feelings and imagination. It was forced by a powerful apparatus and diverse means. Has it managed to uniform memory? dissident and medievalist Karol Modzelewski asked in his autobiography. The decision to move or /liquidate the monument is a resignation from imposing one text on another, joining lines between unrelated (for an uninitiated eye) places. Active meanings “live” until the ideological context that has created them is “alive” - we read in Elements of Semiology by Roland Barthes - and until viewers, able to make connotations, can easily orientate in this context”. It seems that creation of new historical narration would be more effective if places like this were accurately described and if their symbolism was explained thoroughly. 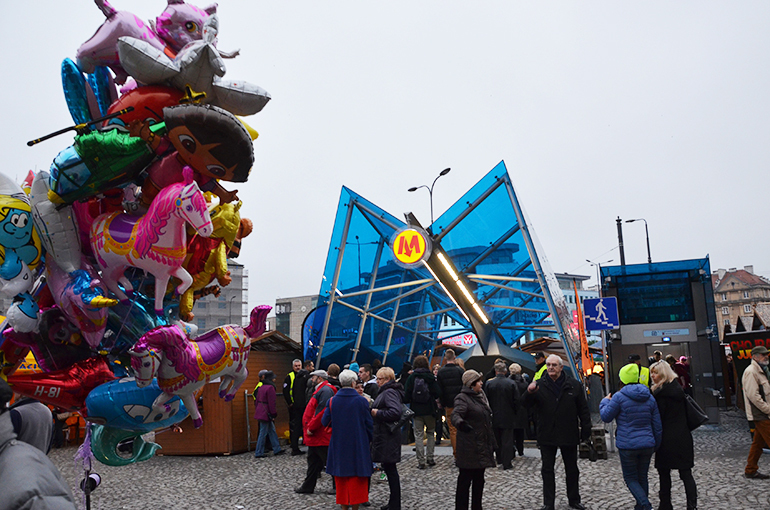 The area around the Wileński square is deficient without the “Comradeship” monument – the Orthodox church doesn’t match with the futuristic, vivid blue subway entries, the depressing edifice of the former Security Office and the nearby shopping centre. Four Sleeping Soldiers was not simply a historical symbol, but an important lesson about politics, a battle of narratives. The monument could also have been a spot for political demonstrations, for example, in the context of Russian invasion of Ukraine (during the Orange Revolution, by the end of 2004, orange ribbons hung down from the “monumental” soldiers’ guns). We can point at similar cases in the history of other countries which found themselves on the wrong side of the Iron Curtain. Take the Red Army Monument in Sofia, for example; it’s regularly repainted: in 2011, the Soviets were turned into Captain America and Superman; in 2013, on the 45th anniversary of the Warsaw Pact’s aggression on Czechoslovakia, they were turned pink and were accompanied by inscriptions reading “Prague ‘68” and “Bulgaria apologizes”; last year, they were decorated with the colours of the Ukrainian flag. Back in Sofia, in 1999, the mausoleum of Georgi Dimitrov, the first Bulgarian dictator, was destroyed (his body had been moved to a cemetery 9 years earlier). Unfortunately, the mausoleum needed to be blown up four times, which for some proved the ineptitude of the authorities of that time and the nonsense of destroying similar memorials. The area left behind the monumental edifice has not been redesigned and Sofia’s main square remains empty. Some have not accepted the decision regarding moving the monument. In December of 2014, Seweryn Blumsztajn, former KOR activist and editor of Gazeta Wyborcza’s capital supplement, published an article: Let’s return to the Four Sleeping Soldiers' case: A chance for a historical compromise. Let’s embed a plaque in the pedestal, we’ll explain what Communists did in 1946. But let’s not forget about gratefulness for the dead soldats – it’s not their fault. IPN (The Institute of National Remembrance) will make a suggestion of the inscription, the City Council will accept it (…) This could be an example for the whole country. We could likely save a few more monuments from those who still fight Communism. Others proposed the creation of new monuments on Wileński square; councillors of the PiS political party wish to commemorate Witold Pilecki, who volunteered to become imprisoned in Auschwitz-Brikenau concentration camp, to create a resistance movement there, and to gather intelligence and escape. We want this monument to be placed on Wileński square in Warsaw, exactly on the spot of the so-called Comradeship monument. We believe that this is an ideal place for Pilecki’s monument, since it would be a symbol of victory of the Underground, the Accursed Soldiers, Polish patriots, over the Soviet plague and Bolshevism – said Marek Wąsik, chairman of the PiS councilmen's club. I will never allow for the history of my father to become a bargaining card in these disputes (…). I won’t let my father’s monument replace the Four Sleeping Soldiers. It’s out of the question. Praga is not a special place for our family. Ireneusz Tondera of the SLD party has come up with a slightly absurd idea – he proposed a monument to the brave King Władysław IV Waza, who granted city laws to Praga, and was a great patron of the arts (the Waza’s court was the site of work of the greatest Baroque composers, including Bartłomiej Pękiel; the first opera on Polish soils was showcased on demand of the young Prince Władysław). Daddy [King Zygmunt III Waza] has his column on the other side of the Vistula River, and Praga can have its own, with his son on it. Of the same size or half of it. Tondera also wishes to see a monument to the Waza king on horseback, because “there aren’t too many of these in Warsaw”. A myth “abolishes the complexity of human acts, it gives them the simplicity of essences, it does away with all dialectics, with any going back beyond what is immediately visible, it organizes a world which is without contradictions because it is without depth”, wrote Roland Barthes. One might want to add that the abolishment of stale myths eliminates any depth.